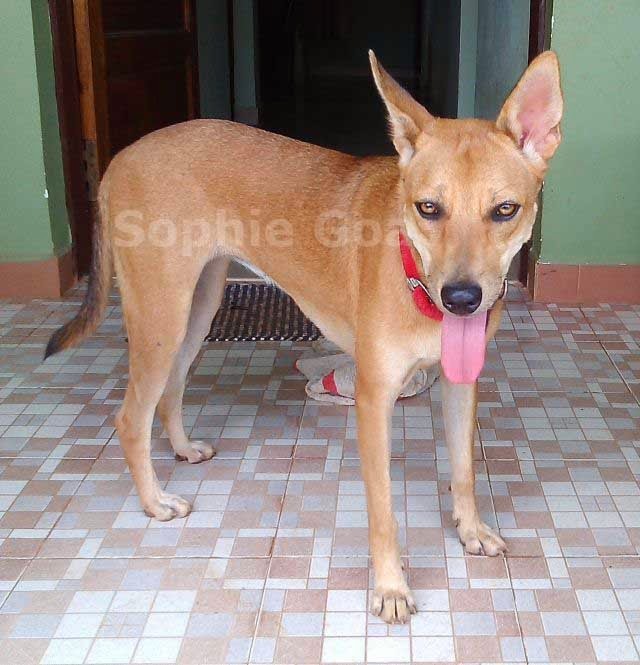 Sophie is a beautiful pet Indy in Goa. 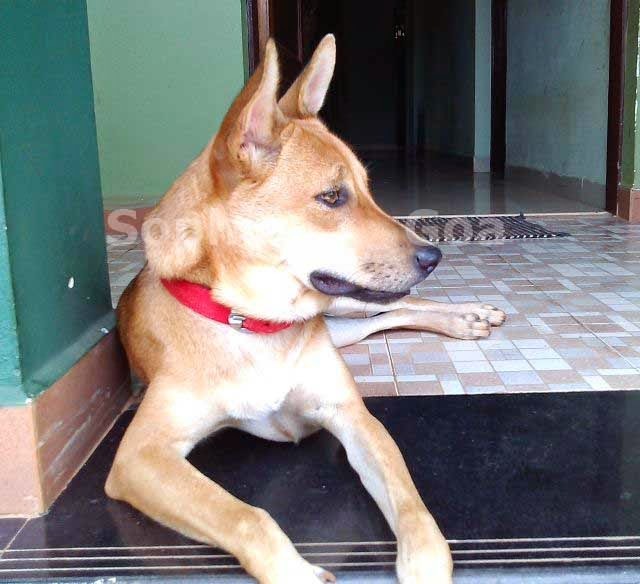 And like most dogs in this blog she has a happy rags-to-riches story. Like Boo, she seems to have selected her own human and arranged her own adoption! 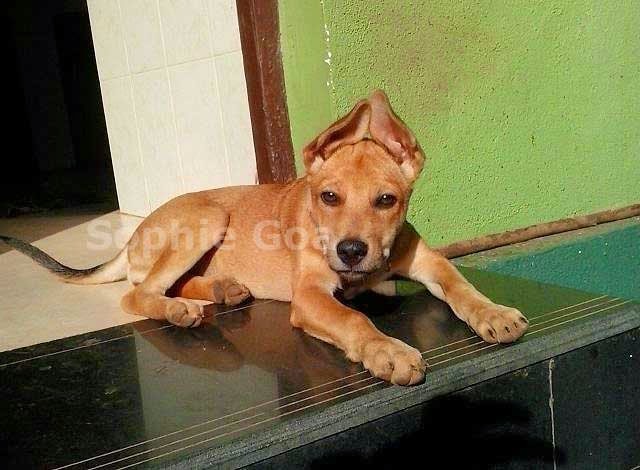 Sophie was born in a drain in the large Margaon main market, in the first week of September 2013, as is typical for dogs like her. 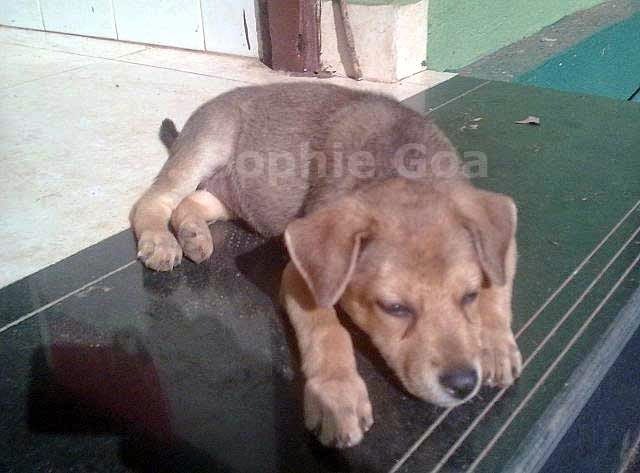 She was one of a litter of four brown pups and the darkest and most mischievous of them all. 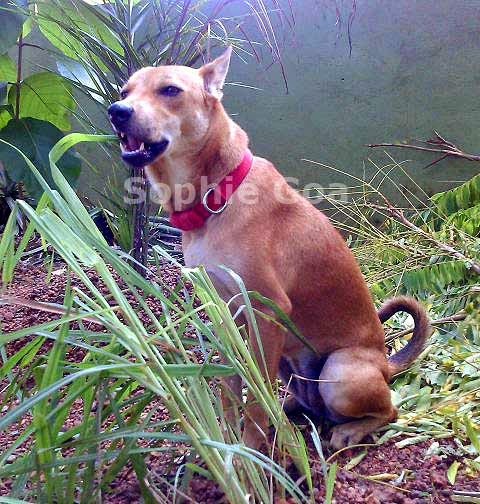 Her mother was a medium-sized INDog street dog, brown too and a slightly darker colour like her. 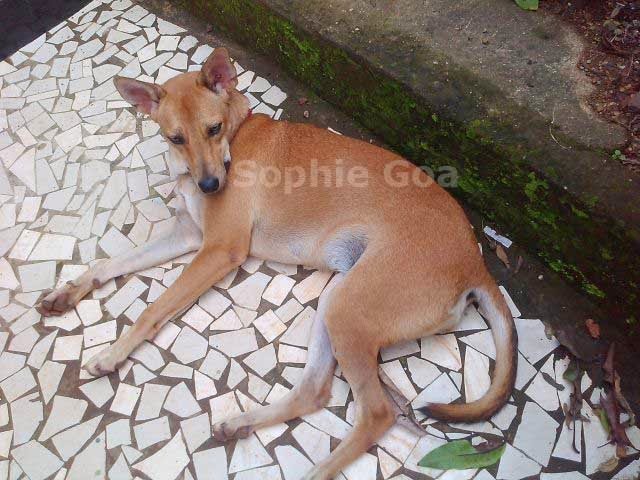 She had given birth to her pups in the safe (and dry, since the monsoons were over in Goa) drain in the market. My friend was not really a dog person and she'd grown up abroad in the Arabian gulf so wasn't really used to or very fond of dogs. A bit scared of them actually. She had had a pet cat, Annie, for a couple of years that she is very attached to. Her dad preferred a dog and his pet dog had recently died so the house was kind of missing a dog. Well, we'd discussed earlier that the house would benefit from a female dog and that we would be looking for one too - but this was sudden. 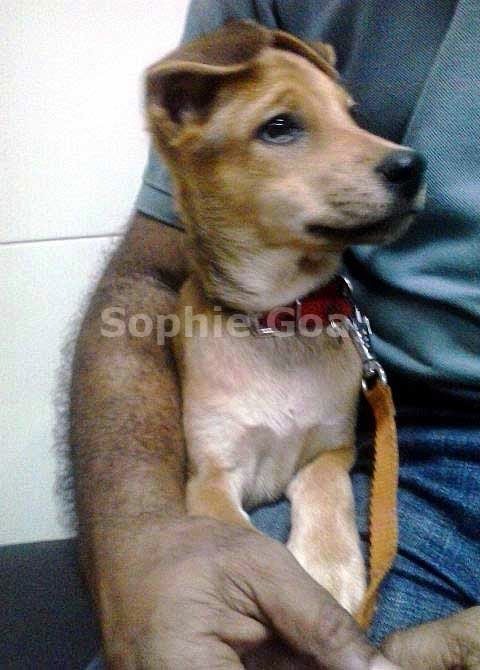 So we discussed it again, thought about it, asked my friend's dad (did not really tell him from where - just that we saw a nice puppy and would like to bring her home). 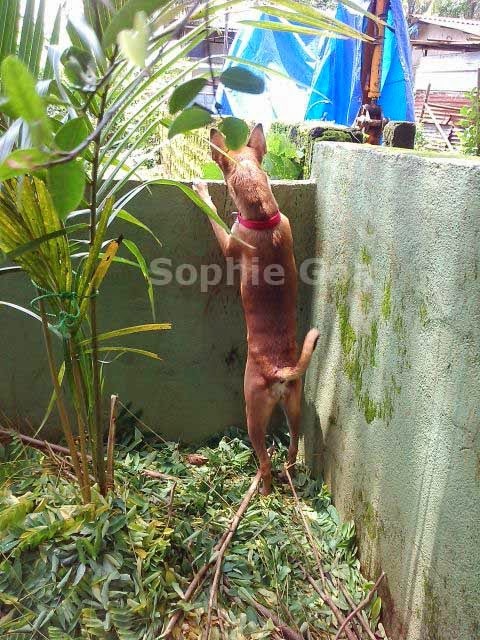 We went back to the market, searched for her a bit and when we called out to her she came running out of her drain. We felt sorry we couldn't take any more of her siblings. But she was all we would be able to handle. We took her home, gave her a nice warm bath, some milk and something to eat, and then to the vet for her deworming tab and some vitamins. She was a cheeky and cheery pup. Barely six weeks old but eating and drinking everything. No yelping or whining in the night or anything. It's almost as if she wanted a home and was glad she got one. 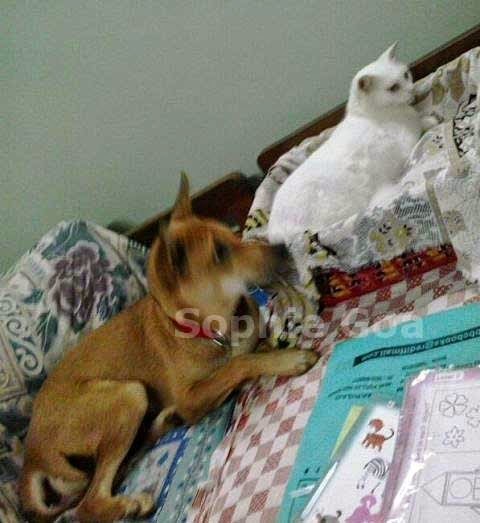 She settled in fine and even became friends with Annie the cat. She loves her bones (boiled please), weekly bath (with nice warm water, no cold water for her) and being towelled dry by her humans. And as can be expected for her very efficient and hardy breed, she's not a big eater - a bit fussy actually - and will often skip a meal in favour of something more tasty or interesting. She likes most fruit, loves milk sweets and her afternoon siestas and everyone spoils her rotten. We had her spayed when she was eight months old as otherwise it does become a problem with pups. She takes her visits to the vet very well, enjoys the outing and car drive and is overall very well-behaved, when out, as opposed to continuously getting up to mischief when at home! She's 10 months old now and is by far the smartest little doggie I've ever seen. And believe me I've seen many-many. She's everyone's friend in the housing colony they live in. Neighbours stop by to say Hi Sophie, and she plays with the kids around when we take her for her walks. We are really proud of her. She holds her own even with all the expensive pedigree dogs in the colony. She is an integral part of the family now and everyone wonders how they ever managed without her.